If you have ever traveled around Europe, you are likely familiar with parking discs. Required in many countries that would rather not deal with parking meters, these devices are placed in the front of a car’s window, and indicate when the vehicle was parked. When parking enforcement officers come through the area, it makes quick work of identifying which cars need to be ticketed. [Michael] received a fancy electronic parking disc as a gift, but the device was incredibly buggy, causing him all sorts of grief. After contacting the manufacturer and receiving no helpful response, he took it upon himself to get things working properly. He dismantled the disc and found that like many products today, the microprocessors were locked down behind a layer of hard resin. Undeterred, he decided to rebuild it from the ground up using an ATmega microcontroller to provide basic parking disc functionality. He also armed his disc with a GSM modem and a GPS receiver – the former gives him the ability to communicate with the device, while the latter provides accurate time data while allowing him to keep tabs on the car’s location, should the need arise. The hacked disc’s guts reside in his glove box, and can be controlled using his iPhone, making it easy to tweak his parking time at will. Check out the video below to see his parking clock in action, and if you have questions on any part of the build, [Michael] says he’s more than happy to fill in any missing details. Do you guys have an LCD parking disc? It would cry for hacking! Ours (in Belgium) is in plain paper, and you risk huge fines if you’re found with a disc that isn’t street legal, such as those mounted on a clock mecanism. I’d like to reverse the protected logic, there is probably some neat algo or code. only problem with them is that sometimes the accelerometer stops working – so if you don’t check that it’s set – you may get a ticket anyhow. How in the world did any committee ever think this was a good idea? I think the guy that had to lean over and chalk tires had it too hard. Now he just has to lean over and read an LCD panel?! This whole parking disc idea is crazy. Why did you implement this technology? Now that this is on the ‘Net, it won’t take long before they are outlawed in Denmark, just wait and see. Wouldn’t it be trivial to design the device so that you never get a parking ticket? It could even tell when someone had leaned over and read it. That would tell it to stop automatically advancing the parking time forward. So that you don’t get caught when the enforcement agent comes back. This all seems too much on the honor system to ever work in the US. Oddly enough, the US has more of an honor system. Lots of parking signs, especially in urban areas, show a time limit on how long one can park in that zone. How is this enforced without a parking clock? It isn’t! I’ve seen people park for a whole day in a “2 hour” zone with no repercussions. …And I got a ticket in a 2 hour zone after running in to get a Coffee…it couldn’t have been 15 minutes…the stupid ***** even burned her hand on my decklid because she didn’t know my car was mid-engined…so she could have possibly claimed I was there for two hours…but you can’t argue with the parking nazis or they will call the real police. In Montreal, they sometimes mark the tires with chalk and come back later to fine all the cars still there after the time limit. Even before people put clocks behind those things, they used to just manually turn the wheel every two hours or however long the parking time is. The parking police got wise and started to employ tricks to detect fraud. For example, take a piece of paper, write down the time on it, and place it on the wheel of the car. 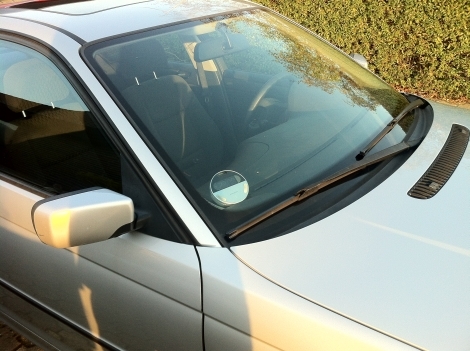 If it’s still there the next time you go around, the car hasn’t moved, and if the disc behind the windscreen shows a different time than last time, you slap it with a fine. Hmm, fraud, sweet fraud. In Germany this will cause you more trouble then the saved money’s worth. That is why they put the note or mark on your tire (ie chalking your tires). If you really did drive around, the mark would have come off. Your best bet for beating parking tickets is to actual beat the cop giving the ticket and bury his body in an unmarked grave, but I think the fine is pretty harsh if you are caught. I’m not completely clear on the disc parking concept. As best I can tell from the wikipedia entry, what this does is set a time limit on how long you can park for free. Ergo, no income for the municipality unless drivers overstay their welcome. I suppose I’m being too US-centric, being used to the situation where you might rent a spot for as long as you don’t mind returning to feed the meter, rather than a system that’s intended to provide more or less equal access to a public space. Parking disc system is not the only system we have. Here (in Finland) you very much pay for the parking space like you say but that depends of when and where you park. City central, near key areas/buildings, parking your car means paying for it. Further away you might find parking space that’s allowed for free but only for limited time – that’s where the parking disc comes in. There are strict rules what kind of parking disc is allowed and you tell your arriving time with it. This doesn’t always mean you can’t pay for longer parking, it’s just an option. Then there’s parking spaces like in front of this building I live in – parking is allowed for limited time, for daytime. The sign says that you have to use parking disc and “2h 8-20 (9-21)” which means “you can park here for two hours if the clock is 8-20 or 9-21 in weekends, otherwise for longer time (overnight)”. Here in Germany, the parking disc system is an alternative to paid parking spaces. Whenever the municipal administration decides that they need free (of charge) parking spaces, for example to support local shops in the inner city or to improve life quality, they usually go for disc parking, which allows for a high user turnover (as you are always limited for a couple of hours). However, there may be some areas where the administration favours money over customers, in these towns you will likely find paid parking tickets (which are often prepaid for half, one or two hours, so these towns also profit from a user turnover but also will receive money for parking). Most often, these parking spaces are at or on the sidewalk or at open places, i.e. not surveillanced. And then there are the classic parking garages, where you will find a post-paid ticket system, i.e. you pay for as long as you park. I must say that I’m not a fan of overextending your parking time. Keep in mind that these are used in parking zones where parking is free, albeit with a time limit. At least in my experience, councils increasingly use payed parking areas, so I wouldn’t try to give them all them more reasons. Also think of fellow drivers who would like to use that parking spot as well. I can understand that. The problem is, if you are a businessman on a job site in one one of these locations. It’s not everywhere there is a possibility to buy a parking ticket (An area called “Frederiksberg” does not have parking ticket machines, so unless you have a permanent license for parking (you can only get that if you live in that area, or have a shop of a certain size) you are actually forced to go on the street every second hour and re-set your parking disc. Nothing short of stupid. And where I live there is a waiting time of around 2 years to get a paid parking spot, so the only option I have now is a 2 hour parking spot… I just don’t bother with the parking disc and use the fine as a way to pay for my parking. Luckily I get fined only about once a month. Wow guys, thanks for your interest! Good to see there is other danish people on HackADay.com! I made the parking disc primarily for the fun and in my spare time – but what’s the fun in having it lying on a table at home! I have not yet come to an actual use of the remote feature, but if I need it, it will be exactly the situation Per Jensen is describing. Also when parking at Burger King with limited parking, it is quite nice to remote change your parking watch from the inside (if you are eating for more than 1 hour!). Has anybody heard stories about being caught for using a hacked disk in Belgium? I want to get one.let me know how can I get it? Where do I start if I want some knowledge about how to do this? Hi. Could it be a hack of the decade if car with parking assistant system would park the car eg. 1h intervals into a new free spot. No driver around just robotic modern car.